Robo-advisors have exploded during the past few years, with the promise to manage and grow your money based on algorithms and technology while offering cheaper pricing compared to traditional human options. Some critics have been suspicious of these automated, digital, and ETF-heavy offerings, pointing to their youth. They have been largely untested during times of severe market stress and economic turmoil. With the market chaos at the end of 2018, many are expecting the current bull market – which began in 2008 – to be in its end phase. Nummo, a personal finance aggregation and education site based in Zurich, saw an opportunity to do some of the first independent analysis ever on robo-advisors. The company, which is unaffiliated with advisors, took public data from 17 of the top robo offerings, analyzing 300 portfolios from Dec. 1, 2017, to Dec. 1, 2018, a time that had big swings in the S&P 500, which ended slightly down. The goal was to see whether these robos would stack up against traditional advisors, and how they scored against each other when it comes to features, costs, and to a smaller extent — since the past is no guarantee of the future — past returns during this period. Nummo broke robo performance into two main categories, examining retirement accounts (traditional and Roth IRAs, 401(k)s) and taxable accounts for more shorter-term investing, and then further grouped robo portfolios by their risk. It also made three more categories for lowest total cost robos, best low-minimum robos, and best robos that offer socially responsible investing. 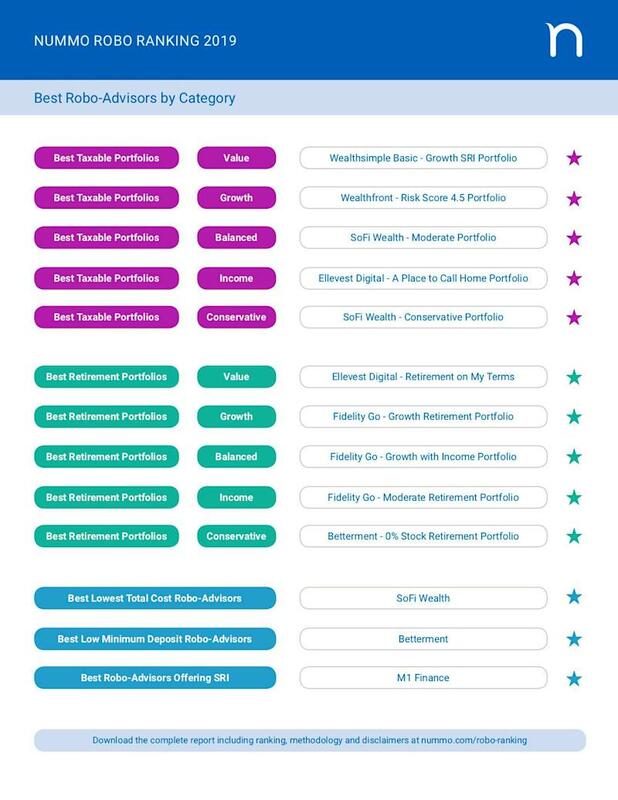 A wide array of the biggest names in robo-advisors earned top honors in various categories. Despite evaluating robos by choosing a volatile time in the market, Nummo’s CEO Roi Tavor said performance only made up 20% of the score, not just because the past is no guarantee of the future, but because other metrics like total cost, which also made up 20% of the score, were far more important. “We know over the long period of time, costs have a major impact on your ability to save up,” said Tavor. 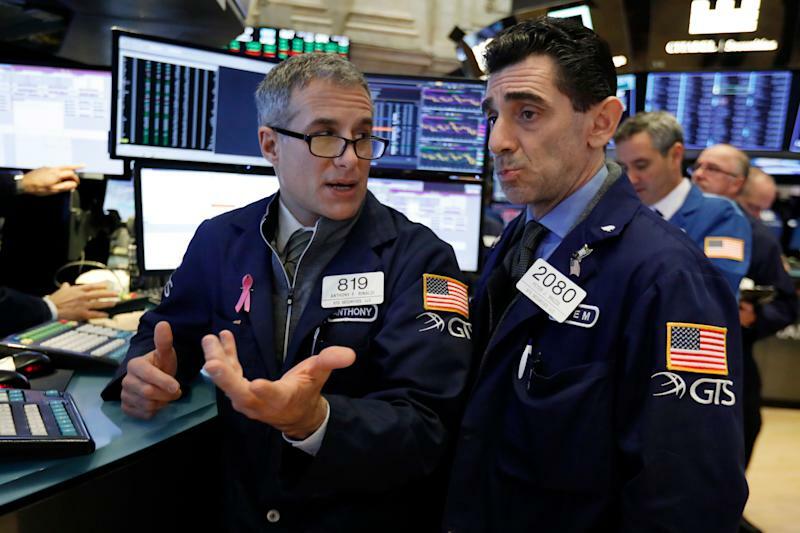 Furthermore, many equity-heavy portfolios often contain similar assets — such as ETFs that track the S&P 500 index — making differentiation by return less interesting than fees and other services. Still, some robos like many offerings from Schwab and Morgan Stanley didn’t make the cut in any categories because their performance was the worst during the review period. Besides fees and performance, the rest of the scoring measured a robo-advisor’s soft power, like access to a certified financial planner, tax services, automatic rebalancing, socially responsible investing, and automatic dividend reinvestment. These are the things people hire an advisor for, as much as a good portfolio return. While performance was deprioritized, Tavor noted that robo-advisor strategies for the mixed portfolios — less equities, more fixed income — showed far more variation. For taxable accounts with 60% in stocks, SoFi Wealth led the category and posted a 9.52% return on its “Moderate Portfolio.” Ellevest Digital’s “Kids Are Awesome Portfolio,” which finished second in the category, had a 5.23% return. WealthSimple’s — respectable — fourth place posted a 0.15% 1-year return. The point here isn’t that SoFi’s CIO is better than the rest, that could be luck. But it is a good reminder that there is both variation in strategies when it comes to mixed portfolios and that things other than performance should be considered, like cost and services. Those things, unlike performance, can be controlled, compared, and purchased. When stocks are involved, you can’t just go out and buy a return. Looking at the study, Tavor found a few surprising things. One was a marked difference between taxable account robos and retirement robos, namely Fidelity’s outsized presence in the retirement categories and its absence in the taxable accounts. In other words, it helps to know what you are looking for when shopping around. The other big surprise according to Tavor was the pricing models of some robos like Acorns, which offer a flat fee. Were Hedge Funds Right About Snapping Up Nordson Corporation (NDSN)?